January 2016 saw an acceleration of the movement of Daesh (asad-Dawlah al-Islamiyah fi al-‘Iraq wash-Sham) — so-called Islamic State of Iraq and Levant (ISIL) — fighters out of Syria and into Libya. There were profound reasons for this “flight to safety” by Daesh, in seeking a new haven as pressures increased on its territorial holdings in Iraq and Syria, but there were also significant ramifications for Libya, its neighbors, and for sub-Saharan insurgencies, particularly in Nigeria. 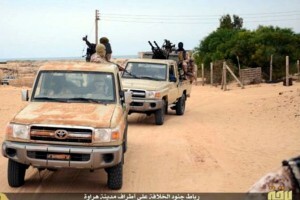 A convoy of ISIL militants in the Libyan town of Harawah on Dec. 6, reportedly headed toward oil fields in the area. Daesh sees in Libya the opportunity to seize oilfields in Cyrenaica, in Libya’s east, to compensate for the loss of control it has experienced over captured Syrian and Iraqi oil supplies, which had been channeled by tanker trucks through Turkey for sale on the international market. Russian air strikes and publicity over the Daesh oil supply line to Turkey — and to Bilal Erdogan, the son of the Turkish President — have severely inhibited Daesh’s revenues and strategic viability. There is justifiable speculation as to the extent of support for Daesh’s moves to strengthen its base in Libya from the Turkish intelligence service, Milli Istihbarat Teskilati (MIT), but there is little doubt that MIT had been assisting Daesh (and its foundational groups), both in Syria and Iraq, as well as in Libya and elsewhere for several years. Turkey has come under increasing pressure to limit its visible Daesh linkage closer to home, largely as a result of Russian — and to a lesser extent Western — military depredations of the Daesh force, and Russia’s strong exposure of the links which Daesh has had with the Turkish leadership and MIT. Moreover, the ambiguous links which Daesh has maintained with Turkey and its other foreign sponsors has meant that the Islamist group has also felt that it could “bite the hand that feeds it” from time to time. There has been speculation — and that is all that it is — that Turkish reports of cooperation in the international “fight against Daesh” have been meaningless and just lip-service. Turkish military operations in this regard have, however, provided an excuse for Turkey to intervene in Iraq and Syria to suppress Kurdish militant groups and to fight those jihadi groups which were working against Daesh. But with effective Russian, Syrian, and Western military action against Daesh targets, the future viability of Daesh as a geographic entity have been thrown into doubt. The upsurge of Daesh strength in Libya, particularly centered around its major geographic holding, the city of Sirte, has come not only from combatant transfers from Syria and Iraq, but also from militants in Egypt, Tunisia, Sudan, and Mali. It is also understood that fighters from Daesh’s stated ally (or component), Boko Haram, may be preparing to move out of north-eastern Nigeria to join the group in Libya as Boko Haram’s territory has become compromised by increasingly efficient Nigerian Armed Forces operations against them, coupled with united action by the N’Djamena- based Multi-National Joint Task Force (MNJTF) comprised of forces from Nigeria, Chad, Niger, and Cameroon. U.S. intelligence sources reportedly told Washington journalist Bill Gertz that at least two jihadist groups had announced in late December 2015 that they were aligning with Daesh in Libya: The Ajdabiya Revolutionaries Shura Council, in Ajdabiya, and a second terror group based in Misrata. Egypt’s Position: The move has direct security implications for Egypt, not merely because of the proximity of the Daesh operations on its border, but because of the parallel functioning (or perhaps identity of interests) between Daesh and the Muslim Brotherhood (Ikhwan), which has committed itself to the overthrow of the present Egyptian Government of President Abdul Fatah al-Sisi. The governing Turkish Adalet ve Kalkinma Partisi (Justice and Development Party: AKP), which has been covertly supporting Daesh, is, by definition, a Muslim Brotherhood party, and has been outspoken in supporting the Egyptian Muslim Brotherhood Freedom and Justice Party (Hizb al-Hurriya wa al-’Adala), and urging that it be restored to office in Egypt. Turkey has been actively supporting Egyptian Muslim Brothers in exile in Sudan, so there is a clear connection between the surge of its members coming from there to Libya. Moreover, MIT has been active in Sudan, working not only with the Egyptian Ikhwan, but also with other groups, such as Boko Haram, in Nigeria. Egypt has responded militarily against Daesh in Libya in the recent past, when either Egyptian expatriate workers there were seized or threatened by Daesh, or when Ethiopian Christian expatriate workers there were under threat by Daesh. Six Egyptian Air Force (EAF) Lockheed Martin F-16s hit Daesh targets in Derna and Sirte on February 16, 2015, when Daesh released a video (on February 15, 2015) showing the beheading of 21 Coptic Christian Egyptians. Significantly, the Libyan Air Force coordinated with the EAF, also striking Daesh targets. Egypt had not coordinated its actions with the U.S. Government, but did call for the U.S.-led coalition fighting Daesh to broaden the scope of its activities to include Daesh components in Libya. The U.S. was cool to the Egyptian-led strikes, and has declined then and subsequently to intervene against Daesh in Libya. It is worth considering whether Egypt’s actions in Libya could, for a period, be constrained by the process of building a new Government in Libya as a result of the December 17, 2015, accord between the Council of Deputies — the “internationally-recognized Government of Libya” — and the New General National Congress to create a new nine-member Presidency Council and a 17- member interim Government of National Accord, with new elections to be held within two years. As a result of this, a period of “indecision” within the rival Libyan factions could also be seen as a period of opportunity for Daesh to consolidate its position, but it could also ensure that there was no decisionmaking partner for a period, in Libya, with which Egypt could coordinate strikes against Daesh. As a result, any new Egyptian strikes, if they occurred, might be unilateral in nature, and would almost certainly be criticized by Turkey and the U.S., acting in harmony (given the unequivocal nature of support by the current U.S. Barack Obama Administration for Turkey). The history of covert White House-run operations in Libya, working directly with the Turkish and Qatari governments, to arm and move in Al Qaida (and later Daesh) linked jihadists to achieve the overthrow of former Libyan leader Mu’ammar al-Gadhafi in 2011, and the subsequent moves by the three governments to consolidate the imported jihadist groups there, makes the Obama White House a hostage to fortune (and Ankara) in any actions in Libya. Egypt, however, would likely be discreetly supported in operations against Daesh and the Ikhwan in Libya by the Russian Government and possibly by the Saudi Arabian Government, which could see a threat to Egypt as a threat to the Kingdom’s main strategic partner. France would also support Egyptian operations in Libya. Nigerian Position: A strengthened Daesh in Libya would ultimately enhance support for Boko Haram fighters in northern Nigeria, and could also help revive jihadist operations in Mali. But a consolidation of Daesh in Libya may take too long to save Boko Haram, and in the short term the process of winning control of Libyan oilfields would be a major priority for Daesh. This would likely draw in Boko Haram fighters now facing an uncertain future within Nigeria, Chad, and Cameroon. In Cameroon, Nigeria, Chad, and Mali, France is also cognizant of the Boko Haram-Daesh links, and would likely work with Egypt to take an holistic view of the conflict. This begs the question, then, as to why Nigeria has not yet begun coordination of its intelligence sharing with Egypt to counter Daesh links from Libya and Sudan into Boko Haram.